PRESIDENT Edgar Lungu has said he will be drawn into discussing his citizenship at the expense of delivering development to the Zambians. The President was referring to claims by some opposition political leaders suggesting that he is not Zambian. 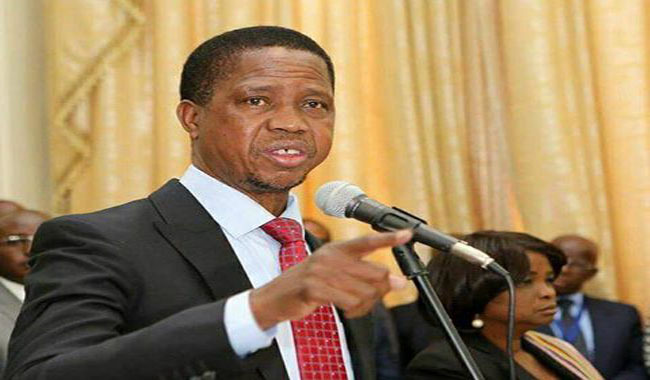 Mr Lungu told Patriotic Front (PF) members at a meeting in Ndola yesterday that he would not be distracted from his commitment to develop Zambia. Mr Lungu said knowing that the debate was a pointless conversation by the opposition, he had largely ignored it but his attention had been drawn to a recent documentary on ZNBC TV in which some long-time residents of Kitwe had taken it upon themselves to discredit the falsehoods. “I didn’t care before but it is very interesting that those who were being interviewed on TV the other day in Chimwemwe Township said I grew up there,” he said. He instructed the PF members not to waste their time on the debate saying it was enough that he had been scrutinised for the elections he had contested and won. Mr Lungu made the remarks when he addressed party officials at Lowenthal Theatre Hall in Ndola yesterday drawn from various constituencies. It was the first time he was commenting on the allegations made by some opposition leaders. The Head of State further urged party members not to engage in pointless debates as people would not distinguish the sane and the not-so-sane. He discouraged members from relying on social media for information saying they risked being misled and that the trend was hindering progress of the party. Mr Lungu warned that the party would not hesitate to take disciplinary action against any erring members. He said he was happy that PF members in Ndola were no longer fighting each other and had found ways of reconciling their differences. President Lungu also urged party members to embrace those who had left the party but were willing to return.